My parents gave us our kitchen table. Or maybe it's a loan. We've never worked out the details. Either way, it is a table that's been around since I was a kid. The seat of one of the chairs bears scratches from the dog we had when I was in university. It's been in the home of my parents, my brother, and now my own. Our table shows its age. The finish is waxy here, worn down there. When the humidity is high, the surface feels tacky. Over the summer, the boys and I were making a birthday card, and there was glitter. Since then, in spite of the newspaper we'd laid out in protection, the tabletop has boasted a random patina of tiny sparkles. I've scrubbed, but the shining scatter remains, a glimmering finish of silver and gold, shot through with turquoise. Subtle at times, and a flashing metallic at the right angle. Around here, peanut butter toast is presented with a disco ball backdrop. Granola gets sequins. A week-and-a-half ago, when I shared the news of my book, I was sitting at that table. And, dear readers, you shone with such light. Your response outshone everything. You were the shiniest part of my day. That evening, I made my mother's minestrone. I should say, traditional or not, Mum's is the version against which I judge all minestrones. Hers has a tomato base, and a bit of beef, then it's bulky with vegetables. When I was growing up, she'd use what was around, maybe corn and peas, always beans and carrots, and different shapes of pasta. What tied it together was oregano. The combination of oregano and tomato, the sweetness of the vegetables and the underlying savoriness of the beef, made it one of my favourite suppers. I'd blanket my bowl with a heap of grated Parmesan and enough black pepper to make me sneeze, and go to town. I still love how the cheese slumps into the soup, both creamy and salty, turning into chewy strands. We had it again for dinner on Sunday. I'd craved it since there were no leftovers from that last batch. The butcher had short ribs on Saturday. Those became the foundation of my minestrone. Braised simply in a tomato and vegetable broth, the meat goes tender, the fat melting into the cooking liquid. The ribs were left overnight, then turned to soup the next afternoon. A quick base of onions, celery and zucchini was cooked with olive oil, dried oregano and garlic, then in went the braising liquid, broth and carrots. The vegetables were given time, cooked to the point they lost some colour but gained all the richness of the broth; the squash especially, as I wanted nothing of the woolliness often found and its centre. The short ribs followed into that mix, accompanied by two types of beans. After another simmer, everything was done, meeting up with bowls of pasta and greens at the table, vinegar for dripping, deeply green splotches of oregano oil, and the aforementioned cheese. Think of that oregano oil as a rough-and-ready cheat's take on an Italian salsa verde. It takes seconds to make, yet the almost aggressive hit of fresh herbs, garlic and chili is what lends moxie to the mellowed, stewy goodness of the soup. It is enthusiastically edgy. And on the topic of the pasta, I like a short, fat variety, think tubetti or macaroni, a kind that has a comforting chew, a sense of substance against the yield of the meat, beans and vegetables. I like this soup for many reasons, for how it feeds a crowd, and for how it can be stretched even further to feed more; for its changeability and adaptability dependant upon season and circumstance; how it can use up leftovers, or made from scratch without fuss. I like that it is a soup I've known for as long as I can remember, for as long as we've had our kitchen table, and for the fact I get to introduce it to you. While there’s quite a list of ingredients here, and the preparation starts the day ahead, the active time is modest and the effort is blessedly easy on the cook. It’s a case of a lot of things stirred into a pot, twice over. Neither the braising ribs or the simmering soup require babysitting, which is to say, for its length, this recipe fits suits a lazy mood surprisingly well. It is hard to pin down an exact measurement on the vegetable stock, but if you have 1 1/2 quarts to use between the ribs and the soup, that should be enough. Keeping both the pasta and greens separate from the minestrone means that with leftovers the noodles won't get mushy and the greens won't overpower or discolour the broth. Speaking of which, I use vegetable broth instead of beef because Mum's minestrone was very much a vegetable soup with beef, rather than the other way around. The day before serving, season the short ribs generously with salt and pepper. Cover and refrigerate for 2 hours, then remove ribs from the fridge and bring to room temperature. Preheat an oven to 350°F / 175°C. Heat the olive oil in a 5-quart Dutch oven over medium-high heat. Brown the short ribs well on all sides. Transfer to a rimmed plate, then pour off all but 2 tablespoons fat from the pot. Reduce the heat to medium. Add the onion, carrot, celery and garlic to the pot, and cook, stirring often, until properly golden and starting to catch in places, around 6 to 8 minutes. Clear the vegetables to the sides of the pot. Add the tomato paste and cook, stirring constantly, until the paste is caramelized, maybe 2 minutes. 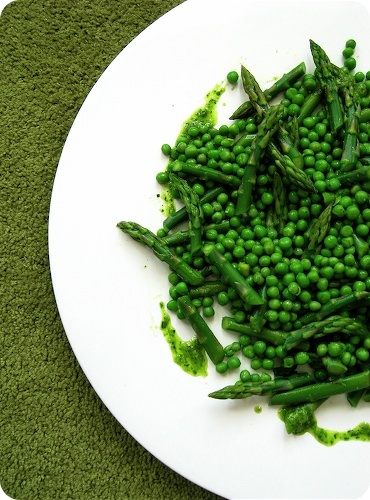 Stir vegetables into paste and cook for 1 minute more. Splash in the vinegar to deglaze, scraping and stirring up any sticky bits. Add the short ribs back to the pot, along with any accumulated juices, then the tomatoes and their liquid. Tamp down the tomatoes, giving them a bit of a prod and squish. Pour in enough vegetable broth or water so that the ribs are halfway submerged. Tuck in the bay leaf. Bring the pot to the boil, cover, and pop into the oven. Cook until the ribs are tender, approximately 2 1/2 hours. Skim the liquid of any impurities, then move ribs to a large bowl. Strain liquid over the meat through a fine-meshed sieve, pushing the vegetables through. Let cool completely to room temperature. Cover and refrigerate overnight. About 2 hours before you want to eat, spoon any fat from the surface of the short ribs and cooking liquid. Leave the the pot at room temperature to lose its chill, say around an hour, then remove the short ribs on a rimmed plate. Set aside the liquid. 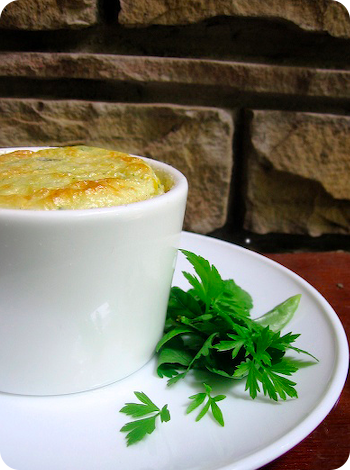 To make the soup, heat olive oil in a large, heavy-bottomed pot over medium heat. Add the onions, celery and zucchini. Season with salt, pepper and oregano, then cook, stirring often, until the vegetables begin to take on colour, maybe 8 minutes. Add the garlic and cook for 1 minute, stirring the entire time. Strain the short rib liquid into 8-cup measure, add enough stock to bring to 8 cups. Add the liquid and the carrots to the pot. Bring to a boil then reduce the heat to a simmer. Let the soup bubble for 30 minutes, stirring regularly. Remove the bones from the short ribs, shred and/or chop the meat into irregularly bite-sized pieces and add to the pot, as well as all the beans. Cook until vegetables tender, 15 minutes or thereabouts. Check for seasoning, and add more broth or water if the soup has become too thick. To serve, spoon a mound of pasta into each bowl, then greens. Ladle on the hot soup. Place the cheese, vinegar and herb oil on the table, letting folks help themselves. Enough for 6 to 8. To make the oregano oil, use a food processor to pulse together 1/3 cup extra-virgin olive oil with 3 tablespoons fresh oregano leaves, 1 tablespoon flat-leafed parsley, a few pinches dried chili flakes, salt and freshly-ground black pepper, until finely chopped. The ribs can be doubled, though you're going to need a bigger pot. Store those extra for another day, with the all braising veg and some of the cooking liquid. Serve over soft polenta. This can be made leftover meat instead. Simply skip the braising steps and go straight to the soup section, adding tomatoes and a bay leaf to the broth. 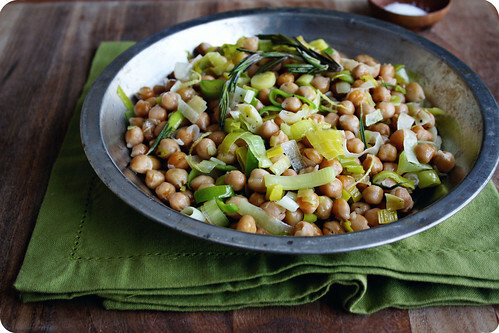 It can also be vegetarian by following a similar tactic, and doubling the beans (chickpeas are particularly good) instead. In the woods I can see from my window, the ground looks patchwork brown and white; an Appaloosa's coat imposed onto the landscape. Much of the snow remains, but in those places where it has gone, it's revealed the rock and earth beneath. I am enough of a realist to accept that this most likely won't be the last of the snow, that the earth might soon again be covered, and that spring is still a ways away for us. For today, that glimpse is enough. Right now I'm content to think of sweaters and wool blankets. But soon, quite soon I think, I'll be longing for the day the snow melts for good. Anxious and fidgety for a trod through that wood in the time of almost spring. Before the shoots begin, when all is brown and filled with possibility. A walk where each step of rubber-clad foot is followed by the echoed squelch of the mud beneath. In my mind's eye I see broad-checked flannel and tins of pretty cookies for later. But first, a thermos full of soup to bring warmth to the enjoyable dampness that surrounds. And as of this moment, if I had to decide, it would be mushroom soup that we'd sip and spoon. I made some yesterday, so even though that picnic upon the forest floor is weeks away, you can still get the general idea of the way I'm thinking. It has an aroma dense with notes of growth and loam. (Loam is such a good word, stretched out and rounded like a yawn.) Both fresh and dried mushrooms are cooked in a pan with olive oil, butter, onion and garlic. After 20 minutes of cooking, the mushrooms have gone through stages of transformation; first pale and spongy, then wet and a soggy, then as that moisture evaporates the mushrooms turn deeply golden and their texture goes satisfyingly chewy. 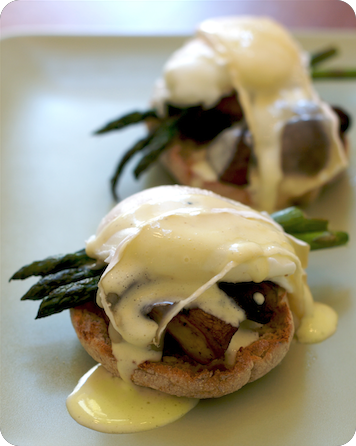 A pour of Sherry to deglaze, it sputters and bubbles into a winey syrup that coats the vegetables in gloss. In goes the stock, and all's left to simmer for 20 minutes more. Whirred to a foaming, ethereal purée, the soup is done save for the indulgent dollop of mascarpone right at the end. And with that, into the woods we go. One last thing, I'd like to thank Stephanie Levy for asking me to be a part of her Artists Who Blog series. If you'd like to take a look at what we talked about, she's posted my interview on her site. From Jamie Oliver, the title's his, too. 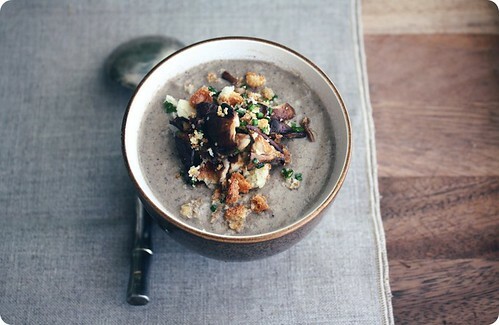 Now mushroom soup depends greatly on the mushrooms itself; not only for flavour of course, but also for colour. The bulk of the fresh mushrooms I used were the bark and black beauties, crimini and shiitakes, with only a handful each of ochre chanterelles and ivory oysters to counter that darkness. A mix favouring the paler varieties would result in a soup with looks more fawn than mouse. That business on top there, there is purpose to that prettiness. 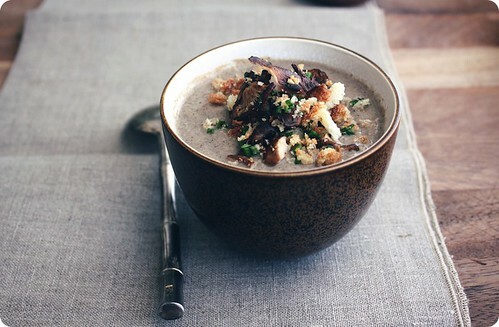 A bit of herbs, croutons torn into buttery crumble, some sautéed mushrooms, together create the ideal counterpoint to the mellow earthiness of the soup; a freshness to the musky depth of its flavour and essential weight against the lightness of the emulsion. Mr. Oliver suggests a tranche of grilled bread instead of croutons, use whichever you like. The only change I made to the recipe was the addition of Sherry when cooking the mushrooms, leaving out the lemon juice to finish. Growing up, my best friend was right next door. It was one of those friendships where sleepovers were weekly, staying over for dinner was almost daily, and company was constant. We were lucky enough to live on a street where everyone knew everybody, where children ran freely from yard to yard wreaking havoc and laughter. It was a great place to live, with pool parties and backyard barbecues crowned with sparklers at the end. Beyond the fun we had, my most vivid memory of these childhood friendships was the food. I think of those barbecues and I can taste the juice of sticky sweet watermelons, I think of strawberries picked from the bushes in the backyard, and of fingers stained a myriad of rainbow colours from Fun Dip. But most of all I think about the kitchens - ours and the one next door. While our house was filled with the flavours of India and England, theirs was bursting with those of Italy. So as much as my Grandmother's shepherd's pie and my Mother's chicken curry figure largely in my remembrance of childhood, so do jars and jars of pickled red peppers, tender veal cutlets, and handmade breads for the holidays. The alchemy of homemade wine was a mystery to us. I was fascinated by the yearly ritual, and the enormous glass carafes that would take up residence in the basement. Oh goodness, and Nutella - that wonderful dark chocolate and hazelnut spread that is nothing short of ambrosia to a 6 year old. As kids, we ate all meals at home, walking home from school at lunchtime. As far as I can recall, the business of meals was simply part of the daily ritual. I never had the impression that it was a bother, or that it was a chore (though it must have been, sometimes). I cannot help but think that it was this assumption of good, fresh food that has shaped how I cook today. Even when tired or frustrated, it is not often that I am too tired to cook. I may be vexed about my day, but I am not vexed about the food. Sure, it may sometimes be simple, but the process of preparing food is integral to the routine of my day; I feel I have forgotten something without it. I am thankful for those early influences, and that food and philosophy are remembered fondly - and often. As with most of us, I am sure, pasta has endured as a comfort food in our household. In its preparation, I sometimes stop to remember those meals from years ago, hoping I can come close to those tastes. While this vegetable bolognese is far from traditional, and nothing I had as a child, it still brings me that sense of comforting nostalgia. Slowly stirred aromatic vegetables cooked until deeply flavoured and tender, then served with hot pasta and a snowfall of Paremsan - how memorable is that? My version was a combination of recipes; as I did not write down quantities as I cooked, I thought it best to simply provide the same guides I used. If anyone would like specifics, please feel free to contact me. • Added 1/2 a large eggplant and 1 medium zucchini to the vegetables called for. As I prefer my mushrooms and eggplant to be well caramelized and golden, I cooked them separately from the rest first, then added them to the soffritto as per the recipe. 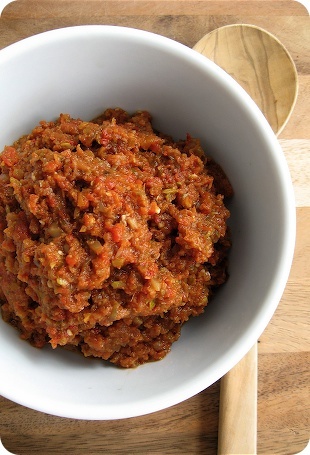 • 6 oil packed sundried tomatoes were puréed and added along with the tomato paste. • The wine was replaced with vegetable broth and a splash of red wine vinegar. • The photograph featured does not include marscarpone, as I intended to freeze a portion; the dairy is added just before serving, and I do believe the sauce needs a bit of richness at the finish. Full fat cream cheese can be used if mascarpone is unavailable. • This sauce is particularly nice when thinned with a bit of pasta cooking water, then tossed through with your favourite medium tube pasta and chunks of fresh mozzarella.